As a general rule, Theatre by the Lake does big melodramatic comedy well. 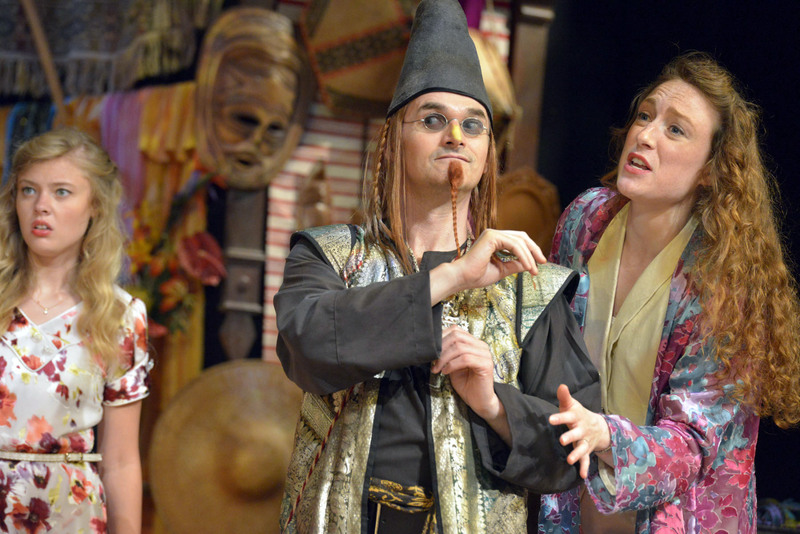 With a string of successful farces under their belt, and the well-executed vibrant chaos of last season’s Comedy of Errors still in mind, it would have been easy for the theatre to get comfortable. All four cast members carried the play with seemingly endless amounts of energy. Jonny McPherson’s was a comical mix of inconvenienced English gentleman and dashing, devil-may-care spy, while Frances Marshall transformed with apparent ease from cunning secret agent to innocent and proper love interest , playing all three of her roles with a humour and energy that sparked off McPherson’s own. Especially brilliant were the two clowns: Patrick Bridgman and Richard Earl. I quickly lost count of the number of characters they each played (often playing multiple characters within the same scene), but each one was unique and entertaining in its own right, and every change was done with superb comic timing. Special mention, though, has to go to the unseen (but not unheard) star of the show: Sound Designer, Maura Guthrie. Every sound effect (and there were many) furthered the comedy of the play, and helped (along with ladders, a few boxes, some scaffolding and a lamp) to bring the world of The 39 Steps to vibrant and hilarious life. 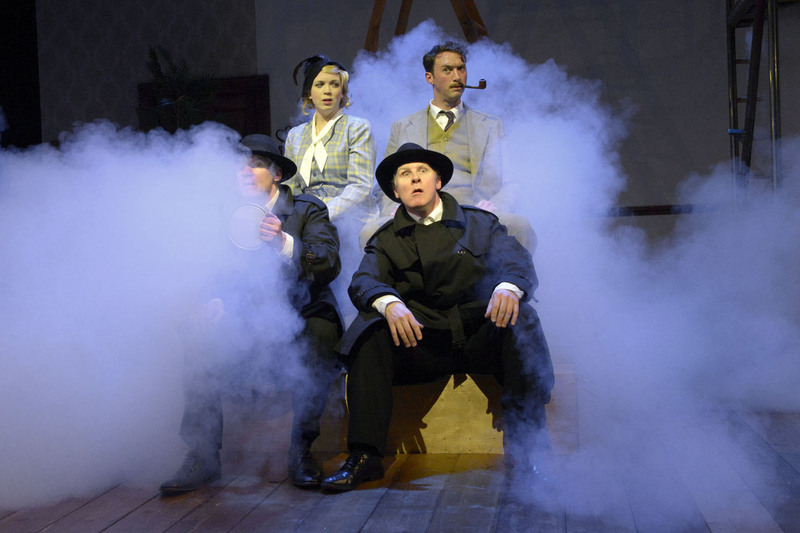 Abigail Anderson’s The 39 Steps is the best thing I’ve seen in the Theatre by the Lake’s main house in years – and the funniest. We laughed out loud from beginning to end, and would happily go back to see it again. It just proves: you don’t need to go to London to see West End-quality theatre. Suddenly Last Summer and Mister Paradise are plays about words: about their persistent endurance and the power it gives them. Where there is power, there is usually fear, and Mary Papadima’s production of Tennessee Williams’ plays contains this fear perfectly, like a wild animal held in a cage barely strong enough. In Suddenly Last Summer, the focal point of this tenuous restraint is the conflict between Mrs Venable (Kate Layden) and Catharine (Emily Tucker). Layden beautifully conveys the desperately wielded control of a woman all too aware that control is slipping away from her, but it is Tucker who truly commands the audience’s attention. Her performance of a frantic and traumatised girl, clinging to the edge, is both powerful and moving; in the battle between dreadful truth and respectable reputation, it is undoubtedly her voice that cries the loudest and speaks the strongest. Mister Paradise is also a conflict between two characters over the issue of truth versus reputation, although it is much quieter than that in Suddenly Last Summer. Both Peter MacQueen (as Mr Paradise) and Charlotte Mulliner (as the girl) address their sides of the question with honesty and sensitivity. Mulliner’s youthful optimism and MacQueen’s more experienced, world-weary reluctance act as two sides of the coin on which Mr Paradise’s legacy spins. The two work well together, sparking off one another so that at times, it is like watching a tennis rally, and other times, like watching a fusion of minds. The two plays sit well together, too. By juxtaposing the two, Papadima brings out the common themes of truth and reputation, and the power of words in creating both. 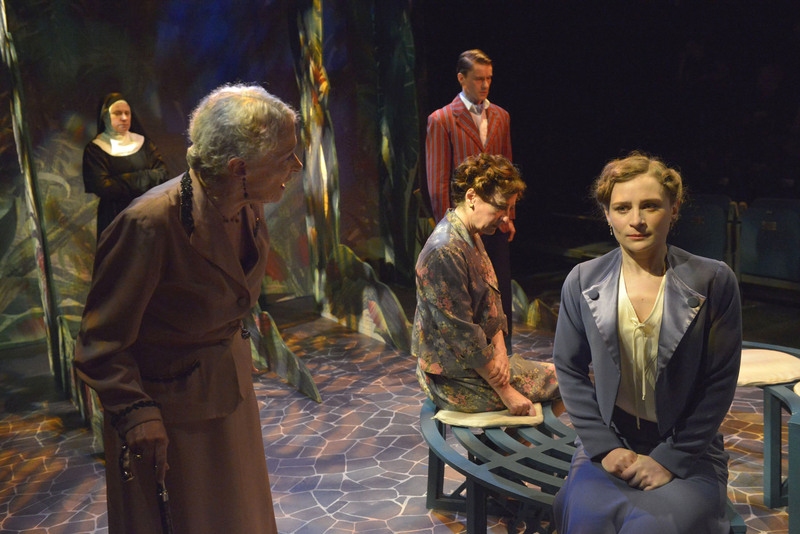 In doing so, she not only puts Tennessee Williams’ two plays up for comparison, but also gives added to power to the words of the plays themselves. When you look around an audience and see a fairy, a man in a top hat and nightshirt, and several pirates, you know you’re in for a good night. 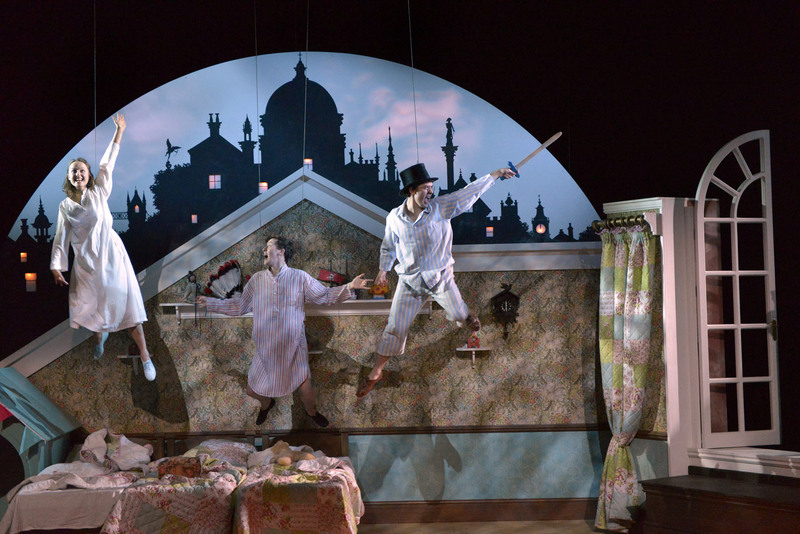 Isabella Marshall, Meilir Rhys WIlliams & Matthew Coulton: photo by Keith Pattison. Any theatre that puts on a production of J. M. Barrie’s Peter Pan is starting from a good place – especially when press night is also fancy dress night. It’s a fantastic story, and has a witty, entertaining, timeless script. But the script also presents challenges, the main one of which is of course flying. To simultaneously fly four actors above the (comparatively small) stage in Theatre by the Lake’s Main House was ambitious, both for the technical staff operating the flight rigging, and for the actors who had to avoid hitting the set or each other. Luke Jerdy as Peter did a particularly exceptional job of making flight look easy and natural. There were a couple of mishaps with the flight equipment (a couple of tangled wires, and a bump against the wall), but overall the ambition paid off. Against the backdrop of Martin Johns’ beautiful set, and enhanced by his vibrant costumes, flight certainly added to the magical feel of the show. The cast brought Barrie’s wonderful characters to life: from Isabella Marshall’s sensible and caring Wendy Darling, to Peter Macqueen’s cunning and somewhat misunderstood Captain Hook. Meilir Rhys Williams as Michael, the youngest, was a delight to watch, captivating the audience with his childish mannerisms and charm. However, it was the Young Chorus who really stole the show. From jellyfish, to mermaids, to the Lost Boys, the younger members of the cast brought their own magic to the performance. They all held their own alongside the professional actors – particularly the Lost Boys, who were challenged with carrying large amounts of the story, and who rose to the challenge magnificently. Despite the challenges posed by the script, Ian Forrest and Mary Papadima created a feel-good production of Peter Pan, which was rounded off by cheers and whooping from a very appreciative audience. Last year, after Swallows and Amazons, I came out of the Theatre by the Lake smiling. This year I came out grinning. There are plays that make you laugh. There are plays that make you cry. Then there are plays that make you think for days after the curtain call has ended and the lights have gone up. Mary Papadima’s production of Harold Pinter’s Old Times is definitely one of these. 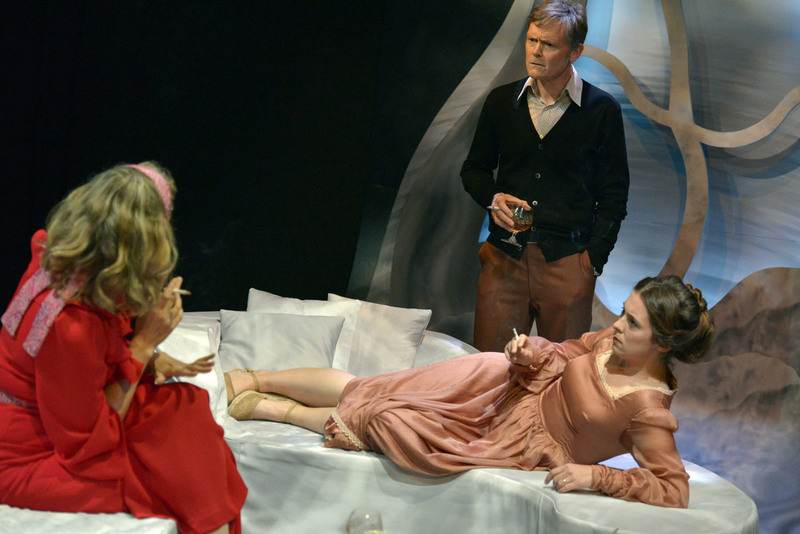 The play appears to start ordinarily enough: a couple, Kate (Rebecca Todd) and Deeley (Liam Smith), anticipating the arrival of Kate’s old friend Anna (Katie Hayes). However, because this is Pinter, all is not as it seems. The surreal curves of the set, reminiscent of a Dali painting, hint at the distorted reality that follows, as Deeley and Anna engage in a power struggle over their claims to Kate. As versions of the past surface, the possibilities voiced (and not voiced) by the characters make the Pinteresque silences spine-tingling – particularly in the intimacy of the Theatre by the Lake’s small studio theatre. It was this intimate space that helped to produce the play’s intense, claustrophobic atmosphere. However, it was the fearsome, electric, and sometimes sensual onstage chemistry between the actors that really created, sustained and then heightened the tension. From Hayes’ Anna, confidence in her own sensuality, to Smith’s Deeley, too full of assurances of his role as alpha male, to Todd’s Kate, often voiceless in her position trapped between the two – each of the three elusive roles was executed with a sensitivity and realism that left the audience unsure whose side to take in the unfolding battle for a kind of dominance. Put all of this against the backdrop of Sanne Noppen’s soundscape of dripping water, rumbles, and low unspecified noises, and the tension and uncertainty in the theatre simmered almost to boiling point. In a play where memories differ and realities are constantly shifting, and the truth of nothing is guaranteed, it is easy to forget that these are actors, and that we as the audience have unwittingly become a part of the layered and manufactured realities that make up the fabric of the play. It is the sort of production that leaves you reeling. The Comedy of Errors has a quite frankly ridiculous plot, even by Shakespearean standards, about the mistaken identities of two sets of twins separated at birth. 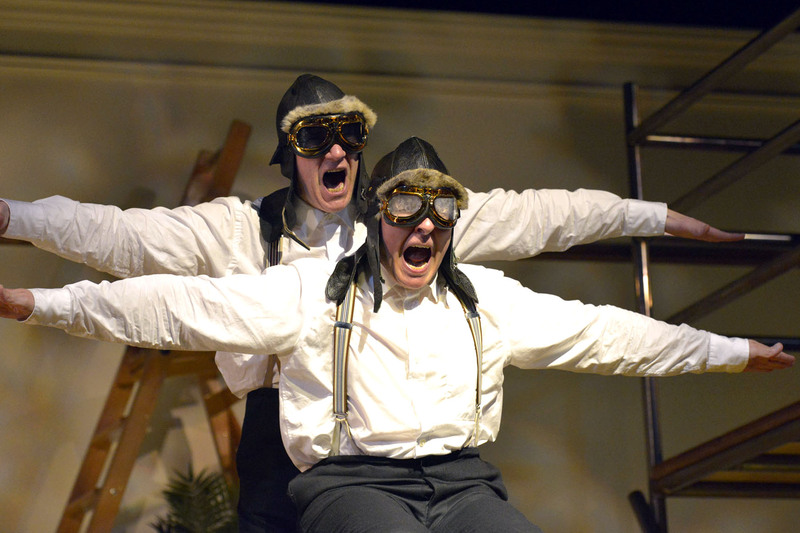 If Ben Travers’ Rookery Nook (also showing in Theatre by the Lake’s main house this season) is an outrageous farce, then Shakespeare’s shortest play outstrips it in its barely controlled madness – which is exactly what makes it such good fun to watch. Fortunately, Ian Forrest’s production of The Comedy of Errors did not try to dial down or intellectualise the humour of Shakespeare’s text. Instead, the vibrant chaos of Martin Johns’ set enhanced the chaotic plot as the characters chased each other around the stage in a manner that would have made Ben Travers proud. Henry Devas as Antipholus of Ephesus and Bryn Holding as Antipholus of Syracuse mirrored each other perfectly in their confusion and bewilderment as the play developed, without losing their individuality as separate characters, while James Duke and Chris Hannon as the two Dromios provided the production with well timed and executed (if occasionally slightly overdone) slapstick humour. The two main women in the play provided another expert pairing, as the sisters Adriana (Cate Cammack) and Luciana (Jennifer English). However, unlike the similarities between the two sets of twins, these two seemed to delight in their contrast, with English’s calm and reasoned demeanour providing the perfect foil for Cammack’s comic hysteria. But it was two of the smaller parts that really stole the show. 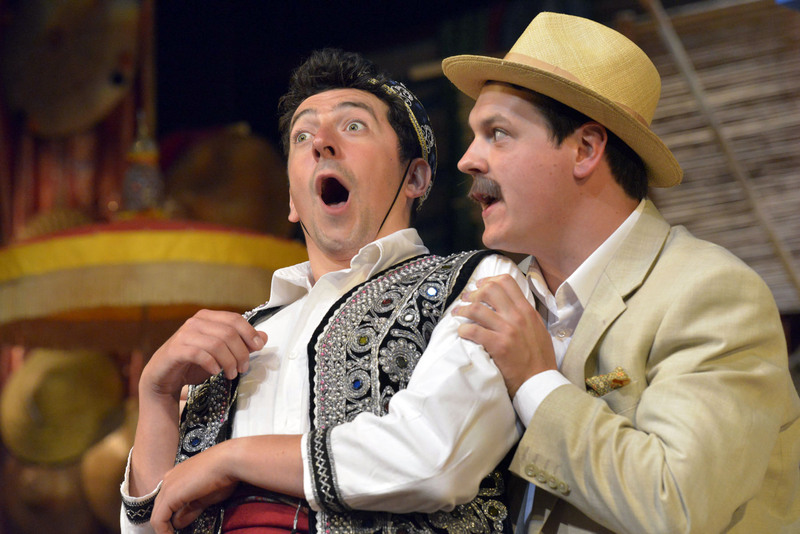 Matthew Vaughan’s superb comic timing was unsurpassed, both as the goldsmith, but especially as Dr Pinch, the hysterical and slightly suspect physician, who attempts to perform an exorcism on the bewildered Antipholus of Ephesus. The other special mention has to go to Peter Rylands, whose silent comic acting as a disgruntled and unsympathetic merchant was easily as engaging as any of the speaking parts. Overall, the production was an enjoyable one, combining slapstick and farce with the more subtle witticisms inherent in Shakespeare’s language. It was an entertaining evening out, from which we came away smiling. It isn’t often that a play can make you laugh and cry simultaneously. Alan Bennett manages it. So does Brendan Murray. At first, Seeing The Lights is a seemingly light and casual play about family disputes. At its heart, however, it is emotional and highly charged. As an ill (and possibly dying) old woman prepares for her birthday, the only present she wants is for the whole family to be together to visit the Blackpool Illuminations like they used to. But one of her children is half the world away in Australia, and the two closer to home are far from united. In the confined setting of a northern terraced house, frictions intensify and old rifts widen. The Theatre by the Lake’s programme describes the play as a comedy, which is largely accurate. However, Murray’s quirky dialogue often catches you unawares, and a surprising turn of phrase can tip the balance between comedy and heart-wrenching sadness – all the more heart-wrenching because of the intimate domesticity of director Stefan Escreet’s production in the Studio Theatre. The two rooms that make up Anna Pilcher Dunn’s set are recognisably unremarkable, while Laura Cox’s portrayal of the central character, known only as ‘Mum’, feels like the sort of person you would probably know. In fact, the whole family dynamic at times feels uncomfortably familiar. Terry (James Duke), the son-turned-carer, is at once universal and surprising, witty and tender. 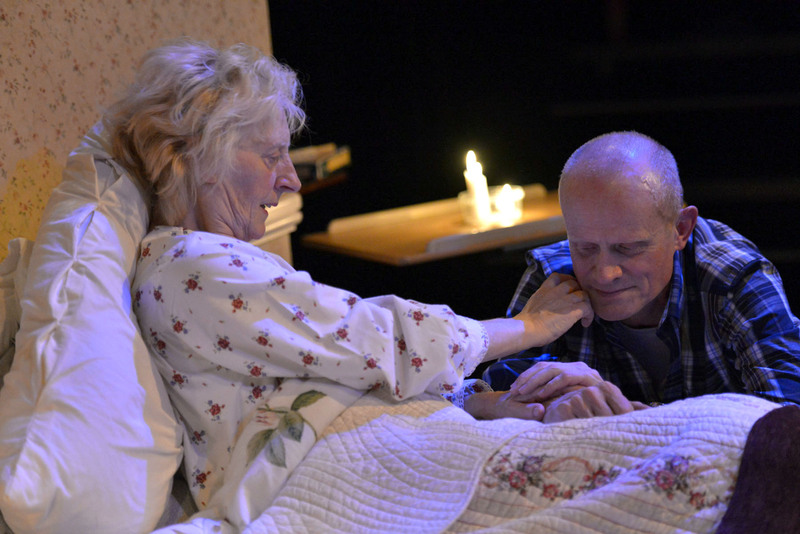 Although Seeing The Lights is very much an ensemble production, for me it was Duke’s honest acting and complex emotion towards Mum that carried the play, and it was for him that I rooted in the warzone of family life. However, some pity also has to be felt for the children’s partners, Ray (Chris Hannon) and Nasir (Alan Suri) – both in their own way caught between two warring camps. Characters who could so easily have become passive and helpless instead provided just enough resistance to the formidable yet vulnerable Muna (Rebecca Todd), to enable the complex and shifting family dynamic that drives the entire plot. It is also what makes Brendan Murray’s play a mirror in which we can see the fraught complexities of any family. At least, I know I can see mine. In anything written by the Scots Makar (think ‘Scottish poet laureate’), you expect a witty and surprising use of language – and Liz Lochhead’s adaptation of Bram Stoker’s Dracula does not disappoint. The script was full of humour and dramatic irony, which Mary Papadima’s production brought out in full, and brought a thoroughly modern feel to the classic tale. Enhancing this contemporary atmosphere was the set, whose clean lines and muted colours were beautifully simple and versatile. Transitions between locations (from Whitby, to Bedlam, to Dracula’s castle in Transylvania) were therefore both swift and entirely believable, aided by Andrew J Lindsay’s video, and Dan Steele’s superbly atmospheric music. The play also contained some stellar individual performances. 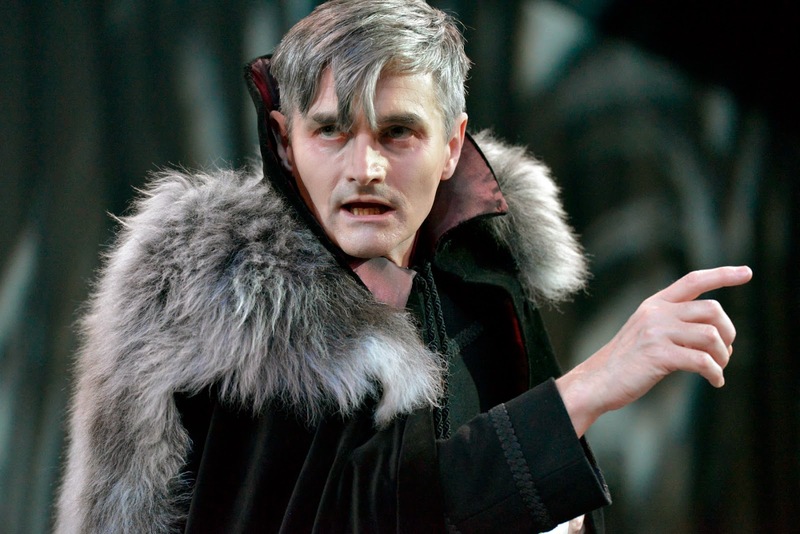 Matthew Vaughan played a formidable yet almost feline Dracula, reminiscent of Olivier’s Richard III. His manipulation of Lochhead’s dialogue was masterful, and he held the audience in thrall as easily as he did the other characters. Opposite the vampire’s cunning intelligence, Henry Devas played Jonathan Harker as a pitiably naive young man, at times almost like a young boy caught in a trap. The two main women also gave excellent performances, with Cate Cammack’s Mina an excellent (comparatively) rational older sister to Jennifer English’s young, wanton Lucy. The other performance which deserves great acclaim was that of Liam Smith’s Renfield. Perfectly balancing the line between madness and reason, his adoption of the character was complete – so complete, in fact, that it took me until the curtain call to recognise him from The Winterling. His physical performance was also very impressive.